Many have been asking me whether they can hit the sauna or steam bath for weight loss. I did blog about this a while back in a post called 5 Health Benefits of Sauna – Boleh Kuruskan Badan? All three can help you lose weight. How? Well in two ways. Firstly, all three will raise your metabolism. For exercise its quite common. Exercise exerts your cardiovascular system. For sauna and steam baths, the extreme conditions (heat, dryness or humidity) forces your heart, blood circulation and lungs to work overtime while you are just sitting there. And when your cardio system works overtime, you will burn more calories. 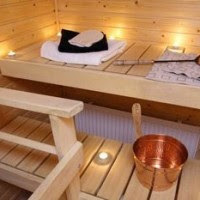 ..depending on your weight and sauna settings, a typical 30-60min session can help you burn some 300-500 calories …. Secondly, all three will help you perspire (sweat) … this can help not only release toxins but most can help you reduce water retention. And yes, water loss is part of weight loss. In fact, weight loss is made up of muscle, fat and water loss. The main difference between exercise and sauna/steambath is … well exercise! Jogging, rowing, football etc don’t just work your cardiovascular system but also help to strengthen your muscles, joints and bones. And yeah, exercise is probably more fun than sitting in a small room with half naked people …. unless perhaps its a co-ed sauna … but that is a whole other topic. In conclusion? All three can help you lose weight. If you can, experiment with all three and see how they make you feel. I personally don’t like saunas or steam baths … I never last more than 5 minutes but that really is a personal choice. Whatever you do, never neglect your physical activities as you can’t replace movement by sitting on your behind.